These items are great gifts for kids. They are execellent favors for birthday parties and sleepovers. They kids cooking kits are great for sleepovers. The lemonade stand kits are execellent for a group fundraiser. Alligator Swamp Cake What is alligator swamp cake? Chocolate pudding, graham cracker crumbs, and much are to make a delicious swamp pudding cake in the bucket; serve with the shovel and garnish with gummi alligators. Great tasty treat for all ages. 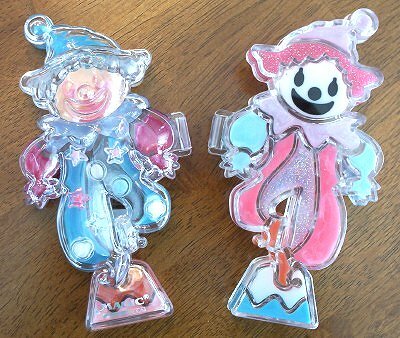 These are great for children's party favors and gifts. Bug Juice An all natural dry punch mix packed in a plastic jar with a paper topper decorated with flowers, bugs and butterflies. Once kids have enjoyed the Bug Juice, they can poke holes in the paper topper and use the jar to collect real bugs. Kit contains bug juice (enough mix to make one - gallon of fruit punch), a net to catch bugs, a magnifying glass and a bug identifying chart. Dirt Cake Beautiful, bright graphics on fiberboard bucket; filled with dirt cake mix (chocolate), Oreo cookie crumbs, mud frosting (chocolate), shovel for mixing and serving, and gummi worms for disgusting decoration. Serve as a cake or in a flowerpot. Duck Confetti Bubble Bath These 9" tubes are filled with 50 grams of lemon scented, duck & circle confetti bubble bath. The colors are yellow, white, and light blue. These duck confetti bubble bath are the cutest things to give as gifts or to keep for yourself. Flavored Honey Sticks These flavored honey filled straws are wonderful! They are very delicious. Add them to your tea, coffee, or cereal. Just bite and pinch the heat sealed end and apply. 12 sticks are packaged in a cellophane bag. 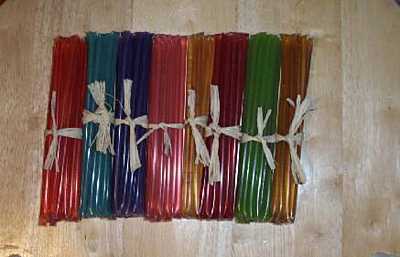 2 sticks of 6 flavors: Amaretto, Cinnamon, Lemon, Mint, Peach, Raspberry, Strawberry, Apple, Watermelon, Cherry, Honey. Flavors and colors will vary per order/package. Price is per bag of 12 straws. 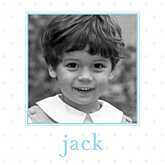 These adorable photo framed art comes in a 2" wide white wooden frame. These are perfect for gifts for children as well as adults. The print size is 8" x 8". The finished size of the frame with art is ~12" x 12". The photo framed art is packaged in a heavy-weight white box. Price is per photo framed wall art. If you are adding text, please put it in the comment field below, just as you want it printed. If you want it in all lower case, please type it that way. It will be printed as you type it. Orders ship in 7 working days from time of approved proof. Holiday orders (beginning October 15) ship 12 working days from time of approved proof. Holiday cutoff is December 1. Rush orders are accepted on a case by case basis for a fee of $40. PHOTO INFORMATION: We accept 300dpi JPEG files via email. By submitting your order, you represent to us that either own the image, and that our reproduction of the image will not violate the rights of any other person. Also, by submitting your order, you agree to indemnify and defend and hold us harmless from all actions, liabilities, damages, losses and expenses, including, but not limited to attorney's fees and costs, arising out of or relating to our possession or reproduction of the image and any breach of your representation in the previous sentence. These adorable framed art comes in a 2" wide white wooden frame. These are perfect for gifts for children as well as adults. The print size is 8" x 8". The finished size of the frame with art is ~12" x 12". The framed art is packaged in a heavy-weight white box. Price is per framed wall art. Please add your text it in the comment field below, just as you want it printed. If you want it in all lower case, please type it that way. 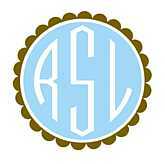 If you want a monogram, please put the letters in the order that they are to be printed. It will be printed as you type it. Orders ship in 7 working days. Holiday orders (beginning October 15) ship 12 working days. Holiday cutoff is December 1. Rush orders are accepted on a case by case basis for a fee of $40. These Girl Talk Notecards are perfect shower favors and perfect for bridesmaids or just thinking about you gifts. 12 adorable, circle-shaped cards that turn into "smart" envelopes. Includes 12 seals. Price is per set of 12 cards. Must order in increments of 6 sets. Up to 1.5 weeks lead time. Always a bridesmaid and never a bride? 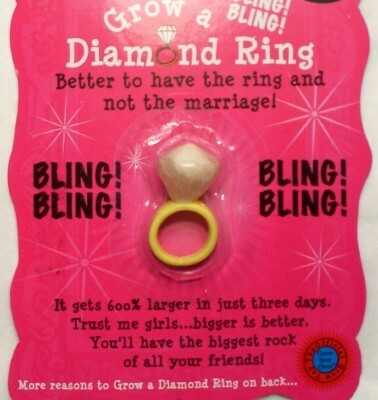 Grow your own diamond ring! These are perfect for your single friends or someone that deserves a large rock! These "diamond rings" grow 6 times their size by just adding water. 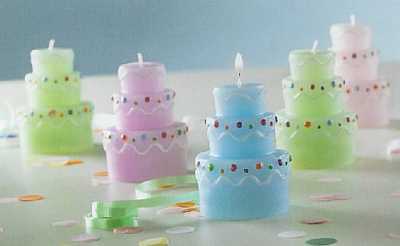 These are really great bridal shower favors or girls night out party favors. Always shopping and purse not growing? Grow your own purse! These are perfect for your shopping friends! These "purses" grow 6 times their size by just adding water. 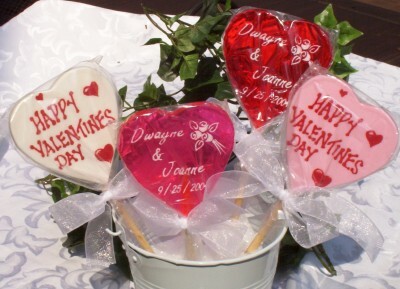 These are really great bridal shower favors or girls night out party favors. 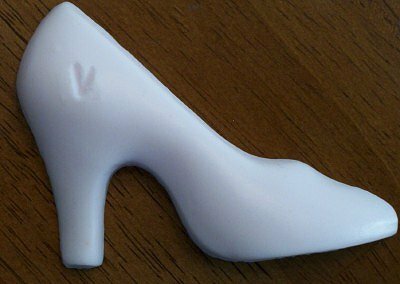 These cute initial shoe soaps are great for shower favors and bridal gifts. 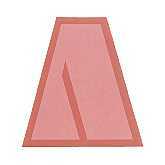 You can choose a different initial for each guest at your baby shower or bridal shower. Or just give them one with your initial. Each ~3" glycerin has an initial embossed into the soap. They are lightly scented and cello bag and tied with a matching ribbon. 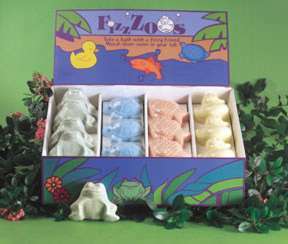 Kidz Fizzies Watch the animal shaped fizzies dance and dive in the tub. 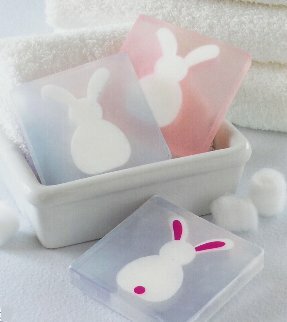 As these cute critters entertain, they are also releasing fragrance and moisturizers into the bath! They contain safe ingredients. These are some Escape Concepts favorites! 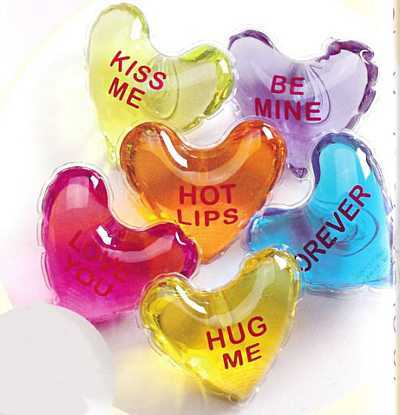 These really cute lip gloss brushes are perfect additions to tea party favors or girls night out parties. 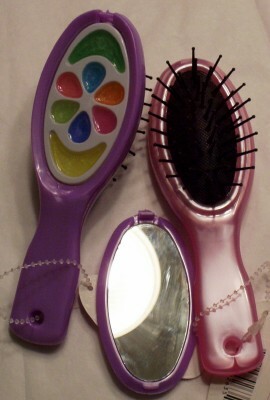 Each lip gloss brush has a mirror and lip gloss in the back of the brush. 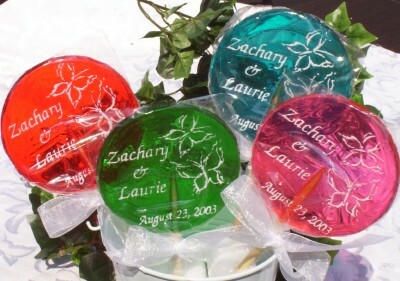 These also make really cute bridal shower favors. Price is per lip gloss brush. 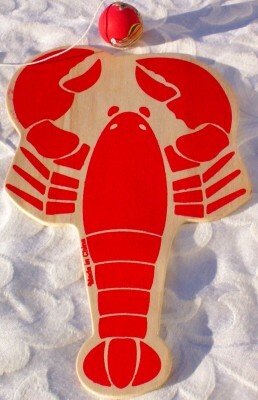 This lobster paddle game is a great novelty item to give your guests at a beach event or summer event. You can easily use them as placecards by using a sharpie to write each guests' name on them. Price is per set of 12 lobster paddle games. These cute baby shoe toe rings are perfect for baby shower favors. The little Mary Janes are very colorful. They are also great for little girls. Everyone loves the little baby shoe toe rings. Assorted colors. 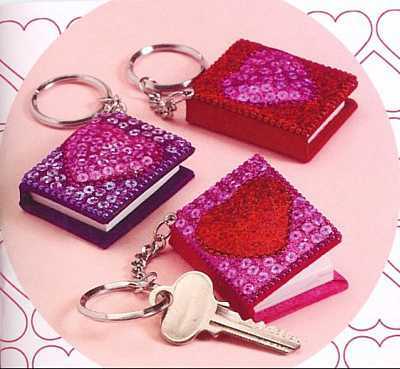 Mini heart key rings / notebooks are sequin and absolutely cute! They are a great ice breaker for party games. You can get everyone's phone number and use them for party games. Each set includes 3" sequin heart notebook key rings in the 3 colors of pink with a red heart, purple with a pink heart and red with a pink heart. Price is per set of 3. 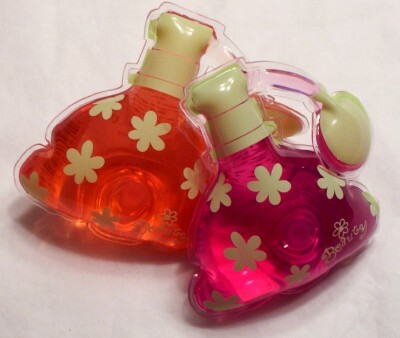 This sweet smelling shower gel is packaged in a "perfume atomizer". These shower gels are ~3". The atomizer shower gels are great for bridal shower favors or girls night out favors. They are just so girly! Set includes 1 pink and 1 coral. Price is per set. These adorable children t-shirts and onesies make the perfect gift! They are so cute. The children's t-shirts are pre-shrunk, 100% cotton and the onesies run large, but shrink a little bit. They are also 100% cotton. There are no special washing instructions for the personalized shirts. They are packaged in a cellophane bag tied with raffia. 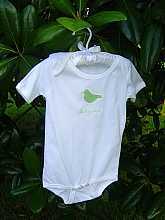 Price is per personalized t-shirt or baby onesie. Please add your text it in the comment field below, just as you want it printed. If you want it in all lower case, please type it that way. If you want a monogram, please put the letters in the order that they are to be printed. It will be printed as you type it. Orders ship in 7 working days. Holiday orders (beginning October 15) ship 12 working days. Holiday cutoff is December 1. Rush orders are accepted on a case by case basis for a fee of $40. October through December 17th, the rush fee is $50 for each different message/paper style. Paper will be printed within 3 business days. This category has a total of 42 products divided in 28 per page.